There's a negative tone on Wall Street as investors react to the latest monthly U.S. jobs report. 1. Jobs jobs jobs: The all-important April jobs report was just released, showing the American economy generated 160,000 new jobs last month. That's below expectations. Economists surveyed by CNNMoney were expecting about 197,000 new jobs to be added. For comparison purposes, the economy added 208,000 new jobs in March, according to the U.S. Bureau of Labor Statistics. The data also shows the unemployment rate held steady at 5% in April, as expected. 2. 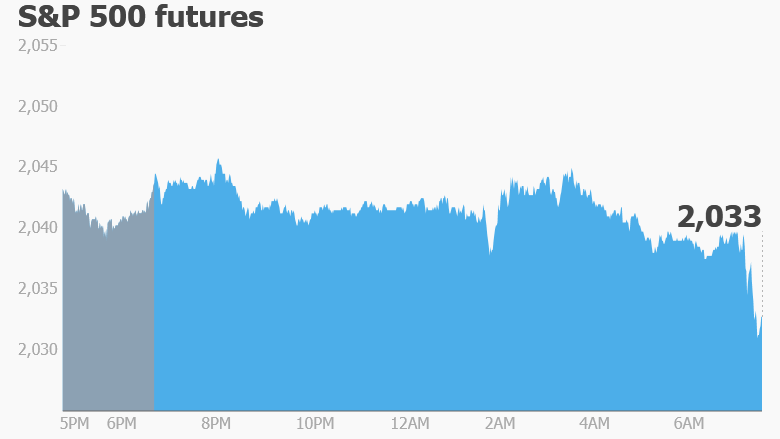 Global stock market overview: U.S. stock futures are shifting down ahead of the open. European markets are declining by about 1% in afternoon trading. Most Asian markets ended the day in the red. This follows a relatively lackluster week in the stock markets. The Dow Jones industrial average, S&P 500 and Nasdaq all shot up on Monday but have been heading lower ever since. 3. Earnings: It's been an exciting earnings season so far and a few more companies are reporting results on Friday. Berkshire Hathaway (BRKB) -- the massive conglomerate run by famed investor Warren Buffett -- is the main company that investors will be watching after the close. ArcelorMittal (AMSYF), Exelon (EXC) and Gogo (GOGO) are some of the other key companies reporting before the opening bell. 4. Stock market movers: Shares in GoPro (GPRO) are set to tumble at the open after the company reported earnings that missed analyst expectations. Shares in Takata (TKTDY) dropped by 8.5% Friday after the Japanese company was forced to recall an additional 35 to 40 million airbags due to explosion risks. This more than doubles the size of what was already the largest recall in history. The news came out earlier in the week but investors in Japan couldn't react immediately as the markets were closed for an extended holiday.